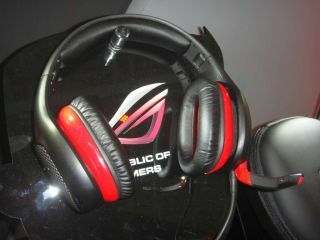 Asus has created a gaming headset, the Asus RoG Vulcan ANC - something we weren't expecting to find at Computex. We've had a play with it and for just North of £100 it looks like it could well be a competitive player in the market. Asus has been making excellent sound cards for the last few years, so to turn its attention to a set of headphones to take advantage of that soundscape isn't a huge leap. The big selling point of the Vulcan is the fact that it's a dynamic active noise cancelling set. This means it has external microphones on the outside of the cans to detect the ambient noise of the room you're playing in. Then it matches that with a negative signal to block as much out as possible. In the throng of the Computex show floor, the fact it did anything at all is impressive and in a quieter area it would have even more impact. Because of the heavy ambient noise of the hall, switching on the active noise cancelling function loses a significant amount of bass through the headphones. Still, despite the fact it is very much still a Republic of Gamers headset, it has taken pains to ensure the quality of the sound when listening to music instead of the sounds of limbs being hacked off in The Witcher 2. We plugged our MP3 player into the headset and plinky electronica was just as clean and crisp as through Shure earbuds. One other surprise was that, despite Asus' Xonar sound card pedigree, the cans were running through a standard 3.5mm jack rather than with a bundled USB-based sound card module. Still if you've already got a decent sound card then that wont bother you one bit.